Dan Lewis shihan began his training in Kyokushinkai Karate in the early 1980s and continued his training with Bryan Dowler shihan, Bernerd Creten sensei and Albert Burton sensei when they formed the British Karate Jutsu Renmei. During this time he also trained in Muay Thai. This he continued to train in until he moved to Bristol to study. Lewis sensei continued his Kyokushin training for a number of years whilst in Bristol, during this time he also trained in Ju Jutsu. Dan partnered up with Stuart Gent sensei who was training in a derivative of Okinawan Goju Ryu under Nick Hughes sensei. 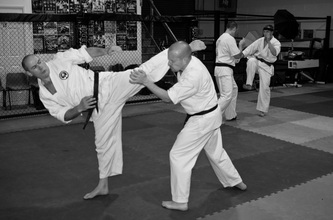 The Kyokushin club closed after a number of years and Dan put all his efforts into his Goju Ryu training. He found that the Ju Jitsu system was not applied enough for real confrontation. Both Dan and Stuart were like minded in their thoughts on martial arts and wanted a system that encompassed real training methods that would generate their desired effects. Crossing over to Okinawan Goju Ryu was a natural progression, where Dan joined up with Gavin Mulholland shihan under the guidance of Kim Roberts shihan and David Arnold shihan. This was a system that utilises both hard karate and softer throwing, ground work and joint manipulation techniques as well as weapons. The renowned martial artist Mr Steve Morris, whom he trained with for a number of years had a profound affect on Dan’s karate. 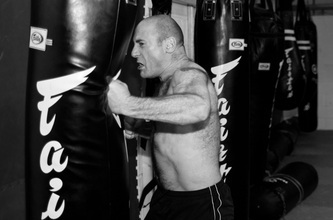 Dan has trained within various systems such as Mugendo Kick Boxing, Muay Thai, Kyokushinkai Karate, Eskrima, Ju Jutsu, M.F.S. (Modern Fighting System), Wing Chun and other Gung Fu systems, he has also taught a number of seminars to the T.A., and has also worked as a doorman for a number of years in Bristol, running a security business for nearly 20 years. Dan has competed in full contact events in karate and Arnis; and having competed in a number of British events became a Bristish Champion, leading to being invited to be part of the English squad in 2000, when he travelled to the Philippines to fight in the World Eskrima Kali Arnis Federation (WEKAF) attaining a Silver medal. However, as Goju Ryu is such a complete system much is already in the Goju Ryu frame work which he teaches to date. 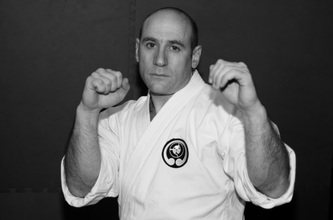 Dan Shihan is Principal Instructor with Gavin Mulholland Shihan (London) running Daigaku Karate Kai – Okinawan Goju Ryu Karate. Dan Shihan continues to explore Goju and other martial arts. He teaches a number of adult clubs in Bristol and also children's clubs. Over the last number of years he has been travelling around the country running seminars and also exploring and writing a book on ‘Sanchin’.